In the first two articles of this series we explored basic definitions and concepts associated with thermodynamic systems and investigated the Laws of Thermodynamics and their implications for process spontaneity, process irreversibility and the importance of the Gibbs free energy. Now we move on to understanding the principles of the Young Equation and how it describes wetting of solids by liquids. I would like to start off with a brief eulogy to Thomas Young (Fig. 1), a true “renaissance man.” Young was a child prodigy who evolved into a voracious polymath, highly skilled as a scientist, physician, physicist and musician. In his fifty-five years he made significant scientific contributions in the fields of vision, light, energy, physiology, solid mechanics, language, music and Egyptology. Early in his career he inherited the estate of his granduncle, which made him independently wealthy and afforded him the luxury of pursuing his myriad of interests. Probably his most important contribution was the wave theory of light, which he clearly demonstrated with his famous double-slit interference experiment. Young’s work in the elastic theory of materials deformation resulted in the tensile modulus named in his honor. In addition to his mastery of Latin and Greek in his teens, Young was able to converse in at least eleven languages including French, Italian, German and a number of Semitic languages. He was an avid musician and could play almost any instrument, including the Scottish bagpipes. He studied music theory and developed a system for tuning musical instruments, now referred to as “Young’s temperament.” Young’s work in capillary phenomena, surface tension and the study of contact angles between liquid drops on solid surfaces led to the Young equation. He was a fascinating man and for someone as talented as Young, he received relatively few honors. The one that pleased him the most was election to the French Academy of Sciences as a foreign member in 1827. Since the atoms in the bulk of a crystalline material are arranged such that the internal energy of the system is minimized, the bonding forces between the atoms in the solid are essentially isotropic. This promotes long range atomic order and close packed crystallographic structures in solid metals. Even in the bulk of liquids and amorphous materials, such as glasses, there is a propensity for short range ordering of the atoms in the structure. However, at the free surface of a solid or liquid material the interatomic forces are asymmetric, so that a net force pulls the atoms on the surface toward the bulk (see Fig. 2). As a result, work must be done against this force to add atoms to the surface and increase the surface area, because energy must be expended in displacing other atoms in the surface. As such, the interfacial free energy can be defined as the reversible work necessary to increase the surface by a unit area (see Eq. 1). This interfacial energy has units of joules per square meter, in other words energy per unit area. For crystalline solids the surfaces which lie on planes with the densest atomic packing exhibit the lowest relative surface energy, so interfacial free energy in these materials is a function of crystallographic orientation. Alternatively, the force required to incorporate atoms into the surface of a liquid by stretching of the surface is referred to as surface tension. Surface tension is defined as the force along a line of unit length perpendicular to the surface and is expressed in units of Newtons per meter, or force per unit length. A dimensional analysis of the units of surface energy and surface tension suggests that they are a measure of the same quantity. This is true for liquids where the values are numerically equal, but not so for solids where the surface energy and surface tension are not exactly equivalent. Nonetheless, the terms are used almost interchangeably in the literature. 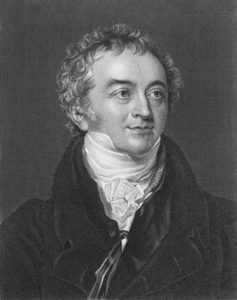 In his seminal paper “An Essay on the Cohesion of Fluids” published in 1805, the famous equation attributed to Thomas Young does not appear in mathematical form. In fact, there are no mathematical equations anywhere in the paper. I feel it is important to appreciate that Young did not derive the equation that bears his name, rather he logically deduced it. Twenty-five years later Gauss introduced the concept of surface energy (sometimes called interfacial free energy and in the case of a liquid, surface tension), which corresponds to the equilibrium forces Young articulated in his essay. Later, Gibbs further developed the thermodynamics of solid-liquid-vapor systems so elegantly that he established the study of phenomena related to relative interfacial free energies on even more solid ground. is a mathematical description of the relationship between the relative interfacial free energies of the three phases that comprise the system. 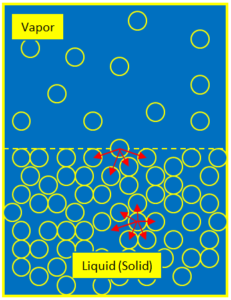 γsv represents the interfacial energy between the solid and vapor, γsl the interfacial energy between the solid and liquid, and γlv between the liquid and vapor. If a liquid drop is resting on a rigid solid in some ambient, say air, the liquid drop will reach an equilibrium configuration with a particular contact angle between the periphery of the liquid drop and the solid, which is a direct consequence of the interfacial free energies of the liquid, solid and vapor. Under non-reactive conditions, an atomically smooth and rigid solid surface, and neglecting the effect of gravity on the sessile liquid drop, wetting is represented by a steady state acute contact angle where Θ< 90° (see Fig. 3). This configuration will always occur when γsv > γsl > γlv. An example of this would be a liquid glass drop on a metal substrate. Here, the relative surface energy of the solid-liquid interface, γsl, is between γsv and γlv, so that the higher surface energy is reduced in contact with the lower surface energy phase. Wetting is defined as the reduction in γsv by the liquid so that the driving force for wetting is γsv – γsl, which is acting on the periphery of the liquid drop. The resisting force is γlv since the lowest free energy configuration for the liquid is a sphere. In the absence of a reaction between the liquid and solid, the driving force for wetting never exceeds γlv, i.e. cos (Θ) can’t exceed 1, and spreading or extension of the liquid drop does not occur. By contrast, the non-wetting case where the steady state contact angle is obtuse and Θ is between 90 and 180° (see Fig. 4) will always occur when γsv < γsl < γlv. As with the wetting sessile drop configuration, γsl is between γsv and γlv so that the higher surface energy is reduced in contact with the lower surface energy and the driving force that defines the degree of wetting is γsl – γsv . The non-wetting configuration is typical of a liquid metal drop on a ceramic or glass substrate. There is a lot of value in understanding the qualitative relationships between the surface energies in the Young equation. Say, for example, that the value of γsv is known to be greater than γlv, but non-wetting is observed, that is Θ > 90°. Then γsl must be greater than both γsv and γlv, which indicates that a true intimate interface between the solid and liquid has not formed due to some unreactive contamination on the solid surface. On the other hand, if γsl is between γsv and γlv then Θ < 90° and a true interface is present. Furthermore, if γlv > γsv and γsl is between them, a true interface is present, but it is technologically unfavorable because the liquid will not wet and penetrate any surface irregularities in the solid. where the arrow indicates that this is a dynamic situation. In a solid-state solution reaction, if only one phase is unsaturated relative to the other, the unsaturated (or solvent phase) is changing its composition and the solute is not. We can then define the solvent as the active participant and the solute as the passive participant. If both phases are unsaturated relative to each other or they form a compound at the interface, then both phases are active participants. In either case, if the driving force for wetting enhanced by a reaction exceeds γlv, then spreading of the liquid drop occurs. This can happen either when γsv is greater or smaller than γlv. The dynamic stage of movement or spreading stops when the liquid is completely reacted. 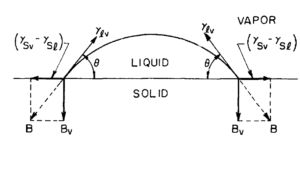 To summarize, the wettability of a solid by a liquid that follows from the Young equation is graphically illustrated by Figure 5. It is now clear that the equilibrium contact angle depends on the chemical makeup of both the liquid and solid. For hard solids, such as ceramics and metals, with covalent, ionic or metallic bonding, the surface energies tend to be high…in the 500 to 5000 ergs/cm2 range. By contrast, weak molecular crystals, such as hydrocarbons or white phosphorus, are characterized by hydrogen or van der Waals bonding. These materials tend to be soft, have low melting points and low surface energies…around 50 ergs/cm2. Depending on the nature of the liquid on these different types of solids, the wetting behavior can span the range from complete non-wetting, shown at the right hand side of the graphic where the contact angle is 180° and cos (Θ) is -1, to complete spreading where the contact angle is 0° and cos (Θ) is 1. As we previously discussed, complete spreading is not realizable without chemical reactions at the solid-liquid interface. The intermediate case occurs when γsl and γsv are equivalent, in which case cos (Θ) is zero and the associated contact angle is 90°.